My son wore an Astros baseball cap to his first birthday party for my own amusement. It was the tenth day of October, in the year 2004. The cap only stayed on for a few pictures and was eventually replaced with blue icing smeared in his hair. 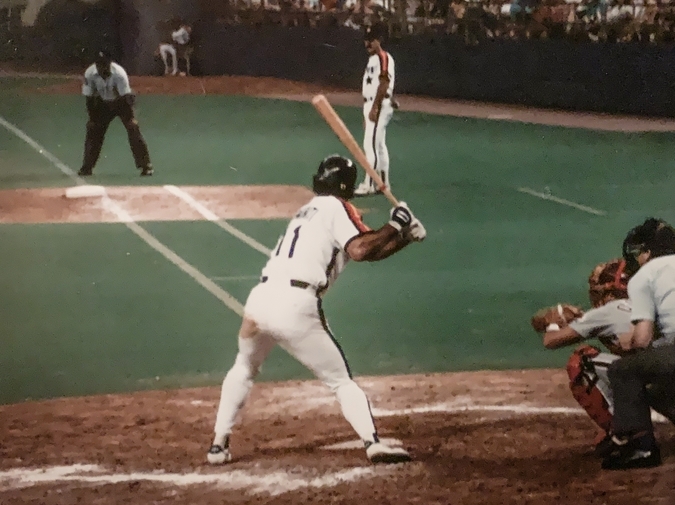 It was also a day, despite Craig Biggio’s three hit effort, the Astros lost a playoff game to the Braves, just as they had done so many times before. Later that evening, Ken Caminiti died alone in a bug infested Bronx drug house. Ken—he told me to call him that—was always patient and kind to me when I was a naïve teenager, too young to be hanging around the Astros clubhouse. It was the 1994 strike shortened baseball season and I was seventeen years old. Somehow, I convinced the Astros Media Relations to give me full media credentials since I was working part-time for a local television station. I used my press pass every free moment I had to absorb the enormity of the Astrodome and the intimacy of spending time with my childhood heroes. I wore blue jean shirts and colorful ties like the rest of the media and did an okay job with the lingo. I figured out when to talk and when to be quiet, when to smile and when to hold a straight face. I was allowed to go by lockers, sit on couches, and stand behind home plate during batting practice to do interviews. Looking back, I am forced to admit to myself that I most likely fooled no one. Eagerness probably gave me away, that and my age. I may not have looked seventeen, but I certainly didn’t look like the rest of the media members; middle aged, beaten down by life, the sparkle of professional baseball long dulled. Another clue was that I was using a voice recorder while wearing television credentials, no cameraman, no camera. Maybe no one paid attention. Maybe no one cared. I talked to Tony Eusebio, Shane Reynolds, and Scott Service a lot. I only talked to Craig Biggio and Jeff Bagwell after victories, never before games. I avoided Ken altogether. He terrified me. He grunted and sulked, always seemed like he was about to take a bat to something. I didn’t want to be that something. Then the strangest thing happened. He spoke to me. He was sitting in a metal chair holding a remote tethered to a tiny television. I sat next to him, unable to speak, smiling enough for the both of us. We stared at the television, watching him swing at a pitch out of the strike zone. He replayed it over and over. Up and away, swing and a miss. We sat in silence watching him swing and miss, over and over again. I wish I could remember how the rest of the conversation went, but I don’t. What I remember is that he asked me a lot of questions and seemed interested in what I had to say. I think I told him the truth, about who I was and that I didn’t belong. He was the first and only player to ever interview me. We had several interactions throughout the season. Once, he asked me to put balls on a tee for him before a game. He took me to a sacred place where media members were not allowed. I sat on a bucket and felt the wind of his bat, watching him explode baseballs into a net. Never had I seen a more serious man. He never smiled. Except for his eyes; he smiled with his eyes. It was the first season he was selected as an All-Star. Two years later he would be named the National League Most Valuable Player while playing with the Padres. Eight years after that, he would be dead. When Ken rejoined the Astros in 2000, I was no longer a fraud. I wore legitimate press credentials as a local sports reporter, and the interviews I did at the brand new Enron Field made air. Ken remembered me. He called me Jay, either because he didn’t know my name or it was a nickname. I like to think nickname. Jeff Barker has many short stories published in literary journals and anthologies including The Broadkill Review, HelloHorror Journal, Literally Stories, and Jolly Horror Press. Jeff is also a healthcare provider in the field of psychiatry. Before that, he had a nine year career as a television news anchor and reporter in Texas, Alabama, Florida, and Oregon. He has interviewed three U.S. Presidents, and stood in the middle of five major hurricanes. His vast life experience and study of human behavior shape his storytelling. Jeff is married with four children. He lives on the Gulf Coast in Daphne, Alabama. You can follow his work at jeff-barker.com or on twitter: @JB_JeffBarker.